Strong demand in the warehousing and e-commerce sectors drove industrial space availability to a historic low of 2.7 per cent in the Greater Toronto Area late in 2017, according to a Newmark Knight Frank Devencore quarterly survey. A Q3 2017 report from NKF Devencore says industrial space availability in Toronto and the GTA was at an all-time low of 2.7 per cent. That’s down from 3.4 per cent in 2016’s third-quarter report. The Q3 2017 survey, released Tuesday morning, also found the tight market is continuing to push rents higher. Across the GTA, average asking gross rents averaged $10.64 per square foot, up from $10.30 in the prior quarter. A lack of modern product, either new-built or recently renovated, is adding to Toronto’s industrial crunch. “It is also important to point out that, by these criteria for modern industrial space, as much as one-third of the available industrial inventory in the GTA is functionally obsolete and suitable for only smaller operations,” Fiset said. Figures cited at the Toronto Real Estate Forum in November indicate the GTA has a total inventory of about 875 million square feet of industrial space, but has been adding less than one per cent annually for the past several years. Participants in an industrial panel at the TREF cited land costs of more than $1 million per acre, as well as high development charges, as key factors constraining new projects. Rental rates which had remained comparatively low for a long period of time also contributed. That is expected to change as supply continues to tighten – a separate report by Cushman and Wakefield predicts Toronto rent increases will top nine per cent over the next 24 months, leading all North American cities. That trend is expected to lead to more development, but in the short term NKF Devencore forecasts another tight year in 2018. “Approximately three million square feet of new space is scheduled to be delivered to the GTA industrial market over the next 12 months, but this will not address all of the pent-up demand,” added Rob Renaud, managing principal/broker of record at NKF Devencore’s Toronto West Office, in the release. The report also notes access to the GTA’s major transportation arteries — especially the 400-series highway network — continues to be an important consideration for tenants, and finding suitable land that addresses this need is increasingly difficult. As a result, it predicts redevelopment of existing structures in Mississauga and Brampton (north and west of Toronto) could increase to meet the requirements of the large warehousing and distribution tenants. 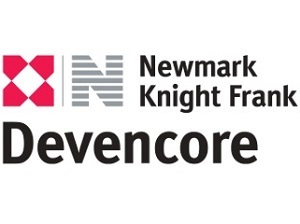 As part of Newmark Knight Frank (NKF), one of the world’s leading commercial real estate advisory firms, Newmark Knight Frank Devencore is the largest privately owned corporate real estate advisor and broker in Canada. NKF Devencore offers clients services designed to ensure executive real estate decisions are supported by effective strategies and professional execution. NKF is one of the world’s leading commercial real estate advisory firms. Together with London-based partner Knight Frank and independently owned offices, NKF’s 15,000 professionals operate from more than 400 offices in established and emerging property markets on six continents. NKF’s platform comprises BGC’s real estate services segment, offering CRE tenants, landlords, investors and developers a range of services including leasing; capital markets services, including investment sales, debt placement, appraisal, and valuation services; commercial mortgage brokerage services; corporate advisory services, consulting, project and development management, property and corporate facilities management services.